Congress was listening. Your House Energy and Commerce Committee passed by voice vote today the Foreign Manufacturer Legal Liability Act of 2010 by voice vote. Now it proceeds to full committee or possibly to Ways and Means or possibly to the floor for a vote. I don't have the bill language yet. Golly, I really appreciate all the hard work to protect me against . . . I'm not sure what. Protecting me against being able to earn a living? One additional point about the design of the extremely ill-conceived Foreign Manufacturers Legal Accountability Act of 2010: the "minimum amount" hurdle that triggers the requirement to register for service of process is NOT set by the law. The different agencies have to set it for the products they regulate. "(4) APPLICABILITY — (A) IN GENERAL.—Paragraph (1) applies only with respect to a foreign manufacturer or producer that exceeds minimum requirements established by the head of the applicable agency under this section. (B) FACTORS.—In determining the minimum requirements for application of paragraph (1) to a foreign manufacturer or producer, the head of the applicable agency shall, at a minimum, consider the following: (i) The value of all covered products imported from the manufacturer or producer in a calendar year. (ii) The quantity of all covered products imported from the manufacturer or producer in a calendar year. (iii) The frequency of importation from the manufacturer or producer in a calendar year." So for those of us suffering under the CPSIA, this legislation tenders some discretion to the CPSC on how penal this provision will be. Interesting, isn't it, that Congress will allow the CPSC to set this threshold without oversight but won't let them assess the risk of pens, rhinestones, science kits or ATVs? Anyhow, given the current practice of the CPSC to apply strict liability standards to so many things, leading to recalls of (for instance) 40 inflatable toy baseball bats for violative phthalate levels (the one-and-only recall for phthalates in U.S. history) and the pending "15 Month Rule" which creates an unbearably expensive and risk-averse scheme of safety compliance, I presume that the CPSC will set these thresholds very low. After all, how else can American consumers sleep well at night??? If you think I am delusional or just tend to see the world darkly, please ask yourself - would YOU disclose ANY of this information to the government of Germany? China? Slovakia? Venezuela? Do you trust foreign governments? The confidentiality of their records? The likelihood that this information will not come back to bite you? Do you expect to get a fair shake in a foreign jurisdiction, particularly in a dispute with a local company? Do you think your suppliers will serve you better if you ask them to do this? Are you important enough to influence your suppliers or would they simply throw you overboard? What will this mean to your business - even if foreign governments refrain from retaliation (unlikely)? This is yet more evidence of the shamefully low quality work of this Congress and its absolute ignorance of the real world. Think of the pending Waxman Amendment which posits that alternative testing methods can be used by small (micro) businesses to avoid certain testing requirements under the CPSIA. Of course, no such testing methods exist but that's just a trivial detail, right? Or the fact that in order to qualify for this "relief" under that legislation, each of these tiny businesses must disclose their financial records to Mother Government to confirm their eligibility for relief. Sounds REALLY workable, right? It does, if you have never worked for a company and have been closeted in the federal government for long enough. Another sad, sorry low point for the worst Congress in history. Well, it's nice to be distinguished in SOME way, right??? It seems that the feeding frenzy over the McDonald's Shrek glasses just won't die. No matter that there are zero reported injuries from cadmium in consumer products - EVER - or that the medical community is basically unaware of any material risk to children from cadmium in consumer products. Yet another news report on McDonald's perpetuated the myth that the presence of cadmium on the outside of the glasses is a danger. Let's start with a basic FACT - CPSC spokesman Scott Wolfson put in WRITING that the Shrek glasses were NOT TOXIC. I have previously analyzed this remark and concluded that "not toxic" is the equivalent of "SAFE" (based on the plain English language meaning of the words). Wolfson has conceded in writing that the glasses are safe. "'CPSC is doing additional follow-up work in the aftermath of the recall,' Wolfson said. 'The case is not closed.'" The CPSC is apparently investigating glasses that Wolfson himself called safe. Don't worry, Wolfson is just trying to keep everybody calm. "Wolfson, the CPSC spokesman, said risk-conscious parents might want to consider using a souvenir glass simply as a souvenir. 'If a parent wanted to be as cautious as possible, they should consider not allowing their child to use it as a drinking glass — to keep it as a collectable or just allow it for adult use only,' Wolfson said." The message here, of course, is that the glasses are NOT safe. But they are. So who are you to believe, Wolfson Number One or Wolfson Number Two? Or not believe any of the Wolfsons because they are playing some sort of game with us that none of us can understand? "'There is nothing wrong with the manufacturing process,' Jose-Maria Aulotte, Arc’s senior vice president, said last week . . . . Aulotte said the cadmium-based pigments are made in Germany — not France, as a McDonald’s spokeswoman previously stated — and are legal 'in all countries we do business in.' He said the pigments are used in red and yellow enamels, and in combinations such as oranges and greens. Once decorated, the glasses are fired at 1,100 degrees Fahrenheit, in a process called vitrification that Aulotte said locks the enamels to the glassware. 'We’re confident all Arc International products are safe for use by children and adults, and are unaware of harmful exposure related to these pigments,' he said via email . . . . Aulotte said he was puzzled why the CPSC tests suggested that routine handling could lead to cadmium exposure. 'It depends on what you do with it. But if you just carry the glass, it should not come off,' Aulotte said." Were the CPSC a logical place with regulators who are concerned about public safety, not public neuroses or headlines, this matter would be long dead. Why couldn't Wolfson tell the Philadelphia Inquirer that the matter is closed, that he has already informed it that the glasses were safe and that the recall was voluntary at the request of McDonald's to reassure the public about its cautious approach to safety? Well, of course, that's not entirely true, as it has been widely reported that the CPSC urged this recall of safe product. What SHOULD the CPSC say? Maybe that they screwed up? Labels: Cadmium, Corporate Casualties, CPSC Leadership, Mass Market Companies, News Reports, Recalls, Who Can You Trust? Never content to leave an economy merely in tatters, Henry Waxman and Bobby Rush jumped into action this week to create an international trade war, all in the name of "protecting" you. In fact, their troubling new legislation includes a sneak amendment of the CPSIA. It also takes an idea dropped from the CPSIA (submission to U.S. jurisdiction) and applies it across several new industries. Sounds promising, right? Nominally introduced by Rep. Betty Sutton (D-OH), a wobbly Democrat said to need propping up in her faltering reelection campaign, the new bill (called "H.R.4678 -- Foreign Manufacturers Legal Accountability Act of 2010") is scheduled for mark-up tomorrow (in Rush's subcommittee. This innocuous and technical sounding bill is packed with trouble for you and for our country. In Sutton's blue collar industrial district, that kind of work is prized. Or so the Dems must think. Here is the GovTrack version of the bill. In fact, I have obtained a more recent version of the bill, a "manager's mark-up" , which includes many new provisions. The revised version of the bill packs quite a punch, right to the gut. I discuss the newer version of the bill below. The purpose of this bill is to make foreign manufacturers of finished goods and parts intended to be used as components in those finished goods register for service of process in this country. In other words, foreign manufacturers must register here so our plaintiff's bar and the government can sue them with ease. The new law prohibits trade with foreign manufacturers unless they are registered, and enlists the aid of the federal government's snarling dog, the U.S. Customs and Border Patrol, to enforce this law. This means that every factory we use outside the U.S. will have to register for service of process in the U.S. if we want to continue to import our products from them. The law goes even FURTHER, asking that each agency involved to study ways to force manufacturers of components to register here, too. So, for example, if you make a toy in China and your factory buys boxes from a local printer who has NO contractual relationship with you, this law asks the agencies to study the feasibility of getting such box printers to register for service of process in this country. To accomplish that lofty goal, of course, you have to know their identity. Our customers do not know our vendors' names and we aren't telling. It's none of their business. Do you think it's any different for our factories relative to us? Will they ever disclose that information to our Mother Government (to them, a foreign government)? Please - would you disclose your sources to the Chinese government? And who pays the administrative and out-of-pocket costs of this exercise? And what about the consequences of the fear factor and the costs of new litigation on markets? What-a-stimulus program! Naturally, those groups most linked to your future business health and ability to create jobs, the plaintiff's bar and consumer groups, think this legislation is long overdue! The scope of this law covers the EPA, the CPSC, the FDA and NHTSA, and applies to drugs, cosmetics, medical devices, "biological products", consumer products, chemicals and chemical mixtures under TSCA (the coming storm), pesticides, motor vehicles or "motor vehicle equipment", plus components for the foregoing. That's pretty much everything and everyone. Oh, by the way, the manager's mark-up adds a little provision that gives you five working days to inform the CPSC if you have "a safety recall or other safety campaign" in any country, whether initiated by the company or by the foreign government. Just thought they'd slip that one in, just in case you weren't watching! So, who cares? Doesn't this "solve" the Chinese drywall problem? In fact, it's going to make things a lot worse. This is Major League trade war material. It is not entirely unlike Smoot-Hawley, the bill that precipitated the Depression. None of our factories will be willing to accept exposure to our ravenous tort system and out-of-control invasive government regulators as a condition of doing business with us. To most of them, this will be too risky and too hard to understand. Our suppliers are small businesses like us - they will NEVER have the resources or skills to master the minute details of our legal system and myriad risks and rules. It will also be breathtakingly expensive for them, and they run very low margin businesses with no ability to absorb those costs. Even if some of our factories will take this risk, many will not. As with Smoot-Hawley's tariffs, this kind of rule will spur quick responses by foreign governments. If the U.S. wants the right to reach across borders and take the assets of foreign companies without a legal presence in this country, then foreign governments will extend the same "privilege" to U.S. companies selling products inside their borders. Won't that be nice?! Learning Resources sells its products in dozens of countries. Will we have to register in each country to continue to do so? Will we be exposed to lawsuits all over the world as a result? Will we have to pay to settle "strike suits" in dozens of new jurisdictions? If the answer is yes, I cannot imagine staying in business across borders. The provision about foreign "safety campaigns" is intended to make sure that we don't miss a trick here. The Waxmanis want a worldwide recall system. Does ANYONE IN CONGRESS know what this will cost? Congress must want to terminate small businesses in our economy. Rumor has it that Ways and Means wants to take this bill out of the hands of the Energy and Commerce Committee. Of course. Speaker Pelosi can skip that step if she wants. Ways and Means purportedly knows there are BIG problems here and I am assured the Republicans on that committee will fight to restrain this bill. Still, it is in keeping with recent House practice to pass something irresponsible and dangerous like this bill, relying on the Senate to stop it. It's a "message" bill, unless it somehow gets passed into law . . . . Then there's the rumor that the Dems intend to stick it into a moving bill, like a jobs bill, to make it impossible to stop. You know, because it's for our own good. This is an example of how I learned to HATE Congress and Democrats. These rules descend on our business in suffocating waves, adding no value but creating major distractions and feeding fear. On the other hand, perhaps I will be eating crow when Obama's recently announced master plan to reduce the deficit by two-thirds in three years through increased spending, increased entitlements, increased taxes and increased regulation works like a charm. Maybe this law is part of the implementation of that great plan. It must be me. . . right? Agency is committing to protecting consumers (that's the angle). The agency is committed to inclusiveness and transparency, so they will be asking for input from stakeholders throughout the process. Will have focus groups and seminars in the near future. Looking for input and to validate their thinking. Will keep you posted on progress and their ideas along the way. Can send in questions for clarification. They NEED our input. Transformation efforts need engagement of all stakeholders. Yet I am now told that the BAH report is due anytime now. Although I requested to be included in this program and although the agency promsied publicly to allow stakeholders to participate in shaping the strategy . . . nothing. It appears to me that NONE of these promises were kept. Rumor has it, however, that the consumer groups were consulted. What-a-surprise! I think this matters a LOT. After all, credibility and trust are destroyed by broken promises, even if by going quiet the agency is able to induce a sleepy state among stakeholders. That's not too hard, given the rotten state of the economy that keeps most business people focused on survival, rather than keeping a close eye on the latest twists and turns from the CPSC. In her keynote speech to the Consumer Federation of America on March 11, 2010, Ms. Tenenbaum bragged about holding RC2, Fisher-Price, Mattel [Fisher-Price and Mattel are the same company, notably] and Target "accountable" for lead-in-paint violations that preceded her term in office. So, if it's right to hold them "accountable" for their failure to do as expected, who should be held accountable for the utter failure of the CPSC to keep its promises on Booz Allen? Or should we just get ready to applaud appreciatively for the strategic report when issued, as though everything's fine? I am tired of getting the shaft in the new CPSIA world. This week we learned that the G-20 nations established near term fiscal deficit reduction as a twin priority with economic growth. The U.S. says it will reduce its fiscal deficit from this year's breathtaking 10.2% of GDP to a mere 4.2% in 2013 (that goal translates to about $600 billion in red ink, more or less). This fantastic goal is apparently based on the premise that Mr. Obama's big spending plans are going to stimulate so much growth that the United States will literally grow away from this problem. Rosy scenario? To my way of thinking, it is delusional government or at least government in a deep state of denial. Those of us suffering from the CPSIA debacle know why - Obama's new withering regulations are strangling businesses and the markets. The environment created by these awful rules are killing jobs everywhere. Mr. Obama's apparent belief that we need a lot more government will render his plan to reduce deficits moot. The passage of time will reveal that thumbscrews are just not a good jobs program. Consider the trajectory of our companies' employment ranks over the past four years. Our headcount reduction in 2007 was 3.2%, 2008 was 15.9% and 2009 was 6.6%. There were two big factors in those reductions - a really lousy economy and a really terrible law affecting children's products. But what about the glorious recovery sparked by our wonderful government? Please note that our businesses are presumably a "beneficiary" of much of that largess because of our dependence on educational sales - schools received MANY billions under the stimulus spending plans. Revenues for first quarter 2010 rose sharply in many industries (an easy comparison to 1Q 2009 but up is up! ), so what about jobs at our companies? January - May: our employee headcount shrunk by 2.3%. We are still not creating net jobs. While we pour endless resources into regulatory compliance, none of which is producing a scintilla of results (and certainly not any sales), we are allowing attrition to lower our costs. We have only so much money - and the government has plans for us to waste it in large quantities. The result - fewer and fewer jobs and a very difficult environment to create jobs. Our total four-year job loss is 25.7%. Some job program. . . .
Mr. Obama prefers to look the other way. While the WSJ notes that "an influential group of U.S. corporate leaders this week accused Mr. Obama of retarding growth with a slew of new taxes and rules", Mr. Obama simply noted at the news conference at the close of the G-20 meeting “We must recognize that our fiscal health tomorrow will rest in no small measure on our ability to create jobs today.” Time for a hearing test? And if it weren't bad enough that Obama endorsed a wishful thinking plan to reduce the deficit through high spending while at the very same time creating the most hostile business environment in recent memory, there is another shoe to drop . . . on you: "President Obama said that next year he would present 'very difficult choices' to the country in an effort to meet deficit goals. The president cited his disappointment with the U.S. tax code. 'Next year, when I start presenting some very difficult choices to the country, I hope some of these folks who are hollering about deficits and debt step up, 'cause I'm calling their bluff.'" What you aren't spending on new health care costs or CPSIA compliance, the government plans to take away from you. And by the way, create some jobs while you're at it. I cannot help but connect the national issues being discussed with our own travails. We are being sent to the gallows by a truly unconcerned CPSC Democratic leadership. They assert that they are making everyone "safer" without looking at data or considering the serious problems being created in the market. Warnings, dire warnings backed up with data and reason, are falling on deaf ears - it's as if the Dems are daring us to go out of business to prove our point. Theirs is a catastrophic policy but it seems as though they are bound and determined to see it through. This is terrible news for you, for your customers and suppliers and for our country. Humpty Dumpty was never the same after he fell over, as we all know. I am committed to prevent this disaster, notwithstanding an uncaring Dem-controlled Congress and Dem-controlled CPSC. I am working for change in Congressional leadership come November, and I URGE YOU to raise money and commit time to candidates offering to help us reform this terrible law. The people who did this to you and me should pay with their jobs. Soon. I have had several reports from the CPSC that they are receiving the following email stripped of an attachment. The email is purportedly from me. It is, however, spam and the stripped file is probably being detached (properly) by the agency's spam filter. The letter is ungrammitical and doesn't make much sense, which I would hope would be a tip-off, but I can appreciate why people think this is from me. The experience of the CPSIA has reached new surreal heights with this incident. Sorry to all the CPSC'rs who are being bombarded by this email. It's not me, REALLY! We discussed the issues presented by the CPSIA 2008. But now, CPSIA is bringing a new problem. All details attached and please consider my views. In a scorching 54-page letter to departing OMB Chief Peter Orszag, the Business Roundtable and Business Council (via Ivan Seidenberg, CEO Verizon Communications, and James Owens, CEO Caterpillar Inc.) outlined the many problems caused by this Administration for the business community. I am pleased to say that the CPSIA made a cameo in this letter (see below), likewise TSCA reform. I am sure Mr. Waxman cares not, but it's nice to know that our issues rank right up there. The bubbling and surging frustration and despair I feel over the two-year CPSIA torture chamber is echoed by prominent business leaders in this letter. Business people are beyond exasperated after 18 months of Obama and his left wing allies who have never had to make a payroll. As I have said countless times now, our company has a sterling record for safety and the children's product industry itself has an almost unassailable record for protecting children from injury from lead and from phthalates (according to the CPSC's recall data itself). How did we turn into public enemy number one? We are left to twist in the wind, and our regulators seemingly could give a damn. I have had enough . . . and that puts it mildly. Here is the letter. You can read the report by clicking on the link above, it's rather interesting. I have also reproduced the verbiage on TSCA and the CPSIA below the letter. As a follow‐up to your request to both Business Roundtable and The Business Council for examples of pending legislation and regulations that have a dampening effect on economic growth and job creation, we surveyed our membership to get their views. Attached are an Executive Summary and detailed description of what they see as government initiatives that will cause slower rather than faster growth. U.S. companies, and creating an environment that fosters long‐term economic growth. We would be pleased to meet with you to discuss any and all of these issues. I apologize, the letter's long. . . . I am hereby submitting comments in response to the Solicitation of Comments on the Interpretation of “Children’s Product” (Docket No. CPSC–2010–0029) published in the Federal Register on April 20, 2010 (the “Rule”). In her statement supporting the proposed interpretive rule defining a “Children’s Product” dated March 31, 2010, CPSC Chairman Inez Tenenbaum noted that the issuance of the Rule is not required by the Consumer Product Safety Improvement Act (CPSIA) but was being issued by the CPSC in response to the demonstrated need of stakeholders. I am such a stakeholder. Our company is in the educational materials and educational toy business and is regulated by the CPSIA. Ms. Tenenbaum notes that the regulated community wants predictability and certainty in the rules that govern the marketplace. She notes that the Commission “listens to, hears, and greatly values the input of the regulated community and all stakeholders”. Ms. Tenenbaum’s statement informs my comments on the Rule. I believe the Rule does not achieve the objectives set out in her statement and must therefore be amended significantly. Having read other comment letters on the definition of “Children’s Product”, I feel that the legal and technical details of the proposed interpretative rule will be adequately addressed by other stakeholders without my further input. I believe that this interpretative rule extends the reach of the CPSIA to many new products not covered or intended to be covered by the law, and furthermore, changes the “Children’s Product” test from one defined by “primarily” to something more mathematical (as in a 51/49 test). However, I will rely on the other letters to make the case on these points. In this letter, I will focus on the impact of the Rule on the marketplace. In particular, I will focus on whether the Rule is consistent with the mission of the agency, is fundamentally sound as policy, meets Ms. Tenenbaum’s objective of clarity, certainty and predictability. I conclude that the Rule needs sharp revision. The definition of “Children’s Product” has been incorporated into this legislative scheme designed to “protect the public against unreasonable risks of injury associated with consumer products”. Of course, “Children’s Products” is now a defined term in the CPSA and interpretation of that term, broadly or narrowly, will affect the scope of the law. Under the terms of the CPSIA, the definition of “Children’s Product” draws products into the coverage of the CPSIA, most notably in the regulation of lead-in-substrate and triggers the imposition of many other significant obligations (such as tracking labels). 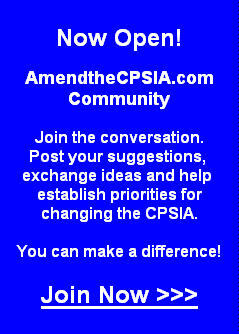 Nothing in the CPSIA overrides the purposes of the CPSC as set forth in the CPSA. Thus, the definition of “Children’s Product” must be evaluated in light of the agency’s mission to protect against unreasonable risk of injury. How risky are children’s products for their lead content? The data in the CPSC’s historical recall database best describes the risk, in my opinion. These recalls reflect the evolving view of the agency on the threat posed by lead in its various manifestations in children’s products, and reflects the dangers posed by lead via the reported injuries. I analyzed the recalls posted on the CPSC website over the past 11 years and this data indicates that, over a period of approximately 11 years (from March 5, 1999 to April 15, 2010), the CPSC issued a total of 899 recalls of children’s products for all hazards (including lead and lead-in-paint). In this period, 247 recalls were associated with lead and resulted in one death, the well-known death of a four-year-old in Minnesota who swallowed a jewelry charm. [The data can be found at http://bit.ly/aOK4iS] These 247 recalls were also associated with three reported but unverified injuries from lead. Thus – over 11 years - the reported injuries from lead are four – one death and three unverified injuries. Contrast this with the injuries associated with swimming pools and spas, a well-known source of childhood injuries. According to the CPSC’s press release dated May 24, pool and spa-related drowning deaths have averaged 385 per year for children under 15 (including 299 per year for children under five years of age) and serious injuries requiring emergency room treatments have averaged 4,200 per year. Consider this data in light of lead: lead produced one death and three unverified injuries in 11 years while pools and spas produced more than one death and 11.5 serious injuries PER DAY in recent years. Pools and spas produce more deaths and far more injuries on the average day than lead produced in the last 11 years IN TOTAL according to the CPSC’s own statistics. The CPSC’s 2010 response to the daily deaths and maimings of children in pools and spas was a short public relations blitz. The CPSIA has imposed annual expenses in the billions of dollars on the children’s product industry to reduce deaths and injuries from lead. If massive numbers of pool deaths and injuries merit only a public awareness campaign by the CPSC, the definition of “Children’s Products” should be downsized appropriately to reflect the relative nature of the “threat” posed by lead. The agency’s recall data on lead injuries has never been challenged by any advocate. Evidence that lead-in-substrate meets the “unreasonable risk of injury” standard set forth in Section 2(b) of the CPSA has never been disclosed. It is well-known that the CDC and the EPA link evidence of lead poisoning to only two environmental causes – leaded house paint (the primary cause) and the residual effects of pollution from leaded gasoline (generally found in dirt near inner city housing) and from industrial pollution. The health impact of lead-in-substrate in ATVs, bikes, pens, clothing, apparel, even toys, is entirely absent from the literature as is any empirical evidence that these items could even theoretically cause lead poisoning. The advocates against lead cite studies that lead can be dangerous in small amounts and highlight the assertion that lead harms “silently”. In other words, advocates claim that because harm can befall children from lead undetected, it follows, ergo, that this kind of harm might also caused by children’s products containing trace amounts of lead. This notion is best summed up by the slogan “there is no safe level for lead”. Yet lead poisoning has never been positively identified from ANY children’s product beyond the one death and three unverified lead-in-paint injuries reported in the CPSC’s recall data over the past 11 years. This absence of data of detectable lead-in-substrate poisoning means that the definition of “Children’s Product” in the Rule must be narrow. The mission of the agency under the CPSA does not permit it to divert resources for anything less than an “unreasonable risk of injury”. The Rule specifies a definition that is too broad for the documented minimal risk of injury from lead-in-substrate. The Definition of “Children’s Product” Knowingly Permits Children to Remain in Danger: The Rule permits children to remain in “danger” of lead poisoning through its technical interpretation of the CPSIA. If lead-in-substrate is a public health issue suitable for the agency’s attention, this is unacceptable. The CPSC must adopt a clear rule that logically draws the line between regulated and unregulated commerce. The Rule attempts to distinguish items of “general use” and items that are primarily intended for children. The Rule notes that items of general use are not included in the definition of “Children’s Product”. An item of general use may in fact be used by children but because it is intended for a general audience, it is outside regulation by the CPSIA. This is an interpretation of the CPSIA under the Rule. The contrast in the treatment of items of general use and Children’s Products under the Rule is quite dramatic: obligations for safety testing, tracking labels, reporting, whistleblower risk, liability risk are all lifted for general use items. Children’s Products suffer the full brunt of the extensive new safety rules, presumably because of an asserted higher “risk” of injury to children. An irony of the Rule is its acceptance of not regulating “items of general use” even if they are known to be widely or even universally used by children. The illogical and worrisome disparity in treatment of these items is best illustrated by pens. According to the Rule, pens are typically items of general use and are therefore (as a general rule) NOT regulated by the CPSIA. This result is quite helpful to the agency, as the pen industry has purportedly informed the CPSC that ball points must be made with brass, and brass has minimal lead content as a basic ingredient. No one argues that brass ball points have ever exposed anyone to injury from lead poisoning, not do “human factor” experts contend that contact with ball points are likely to present a risk of lead poisoning. Thus, the inclusion of pens in the broad reach of the CPSIA has been called an “unintended consequence”. So the “right” answer for all concerned is that pens shouldn’t be included in the CPSIA. The CPSC has consistently held that pens are outside the definition of “Children’s Products”. Notably, it is well-known that close to 100% of school-age children routinely use ball point pens. Children carry pens in their backpacks and use them every day in school. Pens are a particularly ironic choice for this rulemaking example because pens are known to be routinely mouthed (chewed) by all ages of consumers including adults. However, use of pens by kids is deemed “unregulated” under the CPSIA and the Rule because pens have been held to be items of general use. Strangely, pens are in fact subject to regulation under the CPSIA if “decorated or embellished by adding certain features that may appeal to children, such as childish themes or play value”. The Rule holds that if the embellishments are “likely” to attract a child’s interaction with a pen, then it would be considered a “Children’s Product”. So the operation of the Rule is that a pen is subject to regulation if it has an embellishment but not subject o regulation if it omits the embellishment. The CPSC does not indicate that the embellishment itself is a public health or safety concern nor argues that the presence of the embellishment will raise the likelihood of use of a pen by children. The CPSC concedes that children are widely using pens now. This flaw in the Rule will subject the CPSC and its rules to ridicule. There is no justification for the agency’s safety regulations applying only to some pens, not based on evidence of risk but because of a hyper-technical interpretation of the definition of “Children’s Product” under the CPSIA. The Rule simply makes no sense as public health policy. If the presence of lead in ball points is an actual health risk (which it is not), then there is no excuse to omit any pens from supervisory regulation. If the presence of lead in ball points is NOT an actual risk to health, then there is no excuse to regulate ANY pens under this law. Writing an interpretative rule that can’t seem to make up its mind is, frankly, worse than no rule at all. The fact that children were already “interacting” with pens in the absence of the “childish” embellishments seems to be irrelevant under the Rule, raising the issue of how to tell when a product’s use by children is deserving of safety testing or the application of tracking labels. These are “big dollar” questions for the regulated community. If an embellishment is “appealing” to children, then if children “interact” with the pen based on foreseeable use and misuse of the product, it is apparently considered a children’s product . . . unless the embellishment has “just as much appeal” to adults or children, in which case it is a product of general use. And if the pen is unadorned but used by every child due to a marketing scheme directly aimed at the kids market, no testing or labeling is required (see discussion of musical instruments below). It seems so obvious . . . . The clear holding of this “policy” is that stick pens used by every child every day in every classroom do NOT require testing. Were you to remove those ordinary pens from the classroom and apply a “childish” embellishment with inks or paint supplied by the CPSC (stipulated to be entirely lead-free) and then return them to the children, the pens would now need to be tested and labeled. This, of course, makes absolutely no sense, and gives the necessary impression that the CPSC is more concerned with technical compliance issues (test reports without meaning or significance) than with notions of safety. How are regulated companies supposed to follow such incomprehensible or nonsensical rules? There is no answer to this question. Retailers (dealers) take a different tack when confronted by nonsensical rules – they crawl into a shell and invent their own “safety rules” designed to create a cushion between their practices and whatever 20-20 hindsight analyses could be used by regulators. This creates a Wild West of safety rules and practices for manufacturers: chaotic, unpredictable, penal and extremely expensive. The Rule seems to delight in this convoluted reasoning. Consider the Rule’s stance on the marketing of musical instruments to schools: “Products with a marketing strategy that targets schools, such as instrument rentals, would not convert such products into children’s products if such products are intended for general use, regardless of how the instruments are leased, rented or sold. These instruments are intended by the manufacturer for use primarily by adults, although there also may be incidental use by children through such programs.” Incidental use? In many schools, the “incidental use” induced by these targeted programs is nearly 100% of the kids. It is difficult to take the CPSC seriously about its “passion” for eliminating lead in all manifestations when it enacts a rule that openly permits unregulated use of brass musical instruments by school kids while banning brass in toy wheel assemblies or requiring testing for certain pens because of the brass content in their ball points. This policy is best described as “two-faced”. What is achieved by this rule? High expense, much confusion, many arguments with retailers and sharply-reduced respect for the CPSC’s rules. Please note that the Rule leaves all elements of these subjective judgments open to doubt. Consider pens again – because the Rule encourages us to reason from the pen example. The CPSC took no definite position on anything applying to pens other than that an undecorated stick pen is outside the CPSIA. Anything with an “embellishment” presumably will be the subject of endless debate in the regulated community under the Rule. If you guess wrong on the application of the Rule, the law provides (and CPSC practice now reinforces) tremendous liability risk. Let’s not forget that we in regulated community know about the $2.05 million penalty assessed against Daiso for five recalls of less than 700 units in total. Liability risk under the CPSIA seems virtually unlimited nowadays. Subjective interpretative rules applied with 20-20 hindsight by regulators would likely expose manufacturer to the highest risk at the worst possible time, namely when there’s a real problem. How can manufacturers defend themselves? The wishy-washy design of the Rule provides nothing for a manufacturer to rely upon. The Rule makes same similar confusing distinction on DVDs and CDs and seems to imply that many promotional products will be subject to doubt under this Rule. Almost anything useful that has a so-called “childish” embellishment might be regulated now, possibly without the manufacturer even knowing! The Rule states that manufacturers “should expect” that adults will give their embellished or “childish” products to children even if made specifically for adults (the example cited is a stuffed animal sold with a candle). The fact that some businesses target adults with such items (intent! ), or the fact that the Rule contemplates that adults are often drawn to the same items as children, seems to be forgotten here. At a minimum, the Rule seems entirely subjective. This not being confusing enough, the Rule notes that if the items that children are drawn to happen to be considered “collectibles”, then perhaps they won’t be considered children’s products. Or maybe they will. To put a bow on the confusion, the Rule concludes that classic games like checkers or Chinese checkers (among other common games) are NOT children’s products. I simply cannot imagine a toy company DARING to leave these classic games untested yet the CPSC has now officially ruled that certain classic games are exempt from the CPSIA. However, if the manufacturer is foolish enough to promote these games with images “or other features . . . that make [the games] more attractive to or suitable for children than a general use product would normally be”, well then they are magically transformed into children’s products. I literally do not know how to apply a rule so full of convoluted logic and word games. Likewise, I cannot envision smoothly functioning markets governed by a rule like this. Notably, the weight placed on advertising portrayals with children will only intensify arguments between manufacturers and their customers about what is and what is not a children’s product. For instance, we sell magnifiers and tape measures that are identical to those sold at Home Depot. By any definition (and as acknowledged in the Rule), these items are items of general use. We happen to photograph them with children for our catalog and website to illustrate the products’ utility in educational settings. How are we supposed to determine definitively that these items are not children’s products under the law, much less get our customers to agree with us? To date, no customer has agreed with this conclusion. NOT ONE. The Rule posits a bizarrely unrealistic deliberative process in which each photograph is “weighed” against each other to determine its “true nature”, as though that were possible: “The prominence, conspicuousness, and/or other emphasis given to each portrayal of a product’s use or intended users on packaging or in advertising media can be weighted differently according to which images or messages are the strongest and most obvious to the consumer at the point of purchase.” This language makes me want to scream. To avoid business risks under this rule, businesses may have to produce catalogs and websites that look like this: http://bit.ly/d4vtZo. The Rule confounds by assigning responsibility to the manufacturer for its retailers’ independent choices on where they place items in their stores or in their various catalogs, web pages and ads. Of course, each retailer will make this choice differently, possibly store-by-store, catalog-by-catalog, ad-by-ad, web page-by-web page, region-by-region, country-by-country and so on. In reality, this standard is even vaguer than that, as the judgment is whether the images “could imply [the product’s] suitability for a certain age group”. [Emphasis added] In any event, we manufacturers have neither control over, nor knowledge of, these choices by third parties. All this makes me wonder why the Rule doesn’t simply state that the CPSC will decide after the fact what is and is not a “Children’s Product” based on its subjective personal opinion at the time? That rule formulation would at least be honest and clear. I believe the agency has given scant thought to the reality of living with this rule. How does the CPSC envision that a manufacturer and a retailer would resolve a dispute over whether a product is subject to regulation? Think about people who sell pens. What is the likelihood that there ever be agreement that a particular embellished pen is outside this law? I fear the effect of this vague, quirky and completely indeterminate rule will be that everyone associated with children’s products will throw up their hands and assume that everything is subject to the full brunt of the CPSIA. If that’s the intent, I wish the CPSC would just come out and say it. What Should the CPSC Do? The answer to this question is clear in light of two factors: (a) in the Chairman’s statement, she indicated a strong interest in bringing certainty to this rule and further notes the importance of certainty to the marketplace, and (b) the extremely low incidence of injury and death reported from lead in the last 11 years. As noted in great detail above, there is nothing “certain” about the Rule as presently written. It includes far too many phrases like “may”, “could”, “in general”, “weighting”, “factors” and so on. The Rule as written is the antithesis of clarity and certainty. The CPSC has as its mission “to protect the public against unreasonable risks of injury associated with consumer products”. With so few injuries and one death from lead over the course of 11 years, the perils of lead have not been demonstrated to rise to the level of an “unreasonable risk of injury”, particularly when viewed in light of the known impact of so many other dangers regulated by the CPSC (such as small parts or pool injuries). For a rule to bring “certainty” to the market, there must be a way to make a definitive judgment, one that can be relied upon. Subjective judgments and weighing of factors may make sense for a court but has little value to regulated companies in an active marketplace. Who gets to decide which judgment is “right”? Under the present Rule, no one does. The way to resolve this dilemma is to learn from the statistically significant history of low injuries from lead, and make a concession in favor of certainty. The right rule for the definition of “Children’s Product” is to state that the “reasonable judgment” of the manufacturer on what is and what is not a “Children’s Product” under the CPSIA will be RESPECTED by the CPSC. I believe the term “reasonable judgment” is understood in the marketplace, and is also a well-defined term in the common law. It has been clarified in countless cases, providing clear guidance to all concerned (regulators, regulated companies and consumers). The CPSC should further indicate that it will NOT review the judgments made by manufacturers in the absence of fraud, a recall situation or other serious violations of law or CSPC regulations. Retailers should be entitled to rely on the reasonable determinations of manufacturers by RULE. My concept is that the reasonable business judgment of manufacturers will appropriately shape the range of products regulated under the CPSIA. In actual fact, the reasonable judgment of manufacturers on determinations of “Children’s Products” is tightly confined by the CPSIA, so little risk to the “will of Congress” can be anticipated. In addition, given the long track record of so few documented injuries from lead (going back for many years before the CPSIA’s enactment), there is little reason to believe this practical rule will expose children to more injuries. In any event, this will allow the agency to focus its energies on greater threats. The agency also has plenty of legislative authority to draft other rules to address lead concerns if the need arises. A rule drafted in the vague, quirky, subjective, indefinite and convoluted manner of the Rule achieves little other than amplifying the frustration and confusion of the regulated community. Having filed numerous comments letters over the last two years, testified before Congress and the CPSC on several occasions, had personal meetings with CPSC staff, written blog posts, attended rallies, and so on, I can attest to the deep frustrations associated with implementation of the CPSIA. After all this time and effort, we manufacturers are still “in the soup”. With this Rule, the CPSC begins the final stage of the implementation of the law, and potentially, places the capstone on our ruin. This Rule, plus the so-called “15 Month Rule”, taken as a whole, has the potential to put many companies out of business. I do not know how we survive both of these rules in their present form. It’s time for the CPSC to take a reality check. If the Chairman is serious about bringing certainty to the market and to regulate without putting companies out of business, it’s time to make some concessions and let the good companies who produce children’s products run their businesses and accountably produce safe products using reasonable judgment. This strategy will work. Policies like the Rule will not. In yesterday's USA Today article entitled "Lead testing can be costly for mom and pop toy shops", Scott Wolfson, Director of Public Affairs at the CPSC, cited the "positive effects" of the CPSIA on the market. What were those "positive effects" that Wolfson bragged about to the national media? "[Wolfson] notes global suppliers are choosing lead-free buttons for adult and children's clothing, which is safer for everyone and helps shift the burden from small businesses to suppliers up the line. He says Tenenbaum is trying 'to find the right balance between compliance and not putting companies out of business.'" Let's be clear here, Wolfson is talking about making everyone "safer" by eliminating lead-in-substrate in buttons. He is NOT talking about lead-in-paint. Lead-in-paint has been illegal for decades, and a small number of recalls have occurred for lead-in-paint violations relating to buttons. [No injuries were ever reported, of course, but don't get me started.] Buttons have been recalled for coming loose and violating the small parts rules. This is a REAL hazard to small children. Kids can actually choke on a button and be injured. Wolfson is NOT talking about this issue. He is focusing on other "positive effects" from the law. Wolfson also took pains to note that the buttons were being removed from adult clothing, too. Did you realize how much danger you were in before the CPSC was able to induce these "positive effects"? I really appreciate Wolfson bringing this to my attention. Thank heavens for our federal protectors! How many recalls have occurred in the United States for lead-in-substrate in buttons - EVER? According to the CPSC website, ZERO. According to a Google search this morning, I believe this kind of recall has NEVER occurred ANYWHERE IN THE WORLD. And the removal of lead-in-substrate is a positive effect of the law? Is Wolfson responsible to explain this puzzling remark? So after two years of continuous arguing and the devotion of many tens of thousands of man-hours of work to implement the noxious CPSIA by the federal government and industry alike , the CPSC holds up as its great achievement - buttons. Whew, it's safe to walk the streets of America again! Thank you CPSC for seeking the right balance between compliance and NOT putting companies out of business. Yeah, I get it. Unfortunately, by highlighting something as asinine as buttons as a possible lead hazard, the CPSC fuels a long-simmering public hysteria over latent chemical hazards. No one was previously aware that buttons could kill you from their bound=in lead content, but apparently our federal government is quite concerned about button lead content. Isn't that what Wolfson said? After all, why would he mention it to USA Today if it wasn't a problem at all? This kind of remark helps persuade the public that dangers lurk where they can't see them. Lead must be terrible, right, if the CPSC is so hysterical about it? The conclusion is inescapable. And let's not forget the McDonald's Shrek glasses. Cadmium must also be a terrible problem or else why would our trusted federal government urge recall of the drinking glasses out of "an abundance of caution"? Which are we to believe - the CPSC's actions in demanding the recall for undisclosed trace levels of cadmium in the enamel on the OUTSIDE of the glasses, or Wolfson's own written reassurance that the glasses aren't toxic? And of course, there is the Congressional "inquiry" by Waxman and Stupak as further evidence of the "justifiable" health concern. As the relentless stream of breathless and panicked media stories confirm, the public believes that the recall was justified and therefore that cadmium is a real concern, a silent "killer". The fact that there has never been a single reported cadmium injury from a consumer product in this country's history is never discussed. This kind of reinforcement leads to paranoia about many safe products - and makes doing business in the children's market in this country exceptionally difficult and unpleasant now. No one trusts us anymore and the only thing we did wrong was elect the wrong people to Congress. The message that we business people can't be trusted is clogging the airwaves almost daily. The weekly corporate bashings by Congress and the White House paints a clear picture to the American public. You need only consider the treatment of BP, Toyota, Wellpoint, Massey-Ferguson, GM, Chrysler, evil bankers . . . the list is long. We're all bad, right? That's the theme these days. "Yeah...Tests can be costly, but on the other hand death seems to be pretty costly also. But I guess the determining factor will always be money. Save 10 cents, 10 dollars, 100 dollars at the cost of someone else." "Well if they cannot test the products they make to insure that our children are safe. Then its time to start making other items. The simple fact is that the Chinese and our bought and paid for congressmen/congress women have allowed this to happen. My opinion ban all products from China since it is evident that they do not care for the health of our citizens." "WE can never ever trust the Chinese. They are the worst people! Why do we do any business with them is beyond me." "This is just more gov regulation that the GOP says get's in the way of the Free Market. Let the Free Market get the lead out on it's own. Too bad there's no profits in 'getting the lead out'. It's cheaper to use lead as a filler, and hire lobbyists to pay-off congress. We've got it all dialed-in in America!" Thanks for all the help, CPSC. You sure are helping our market. Your efforts will only succeed in driving the good people out of this market, along with their good products, their innovations, their productivity gains and their jobs. And who will be around to help educate your kids and grandkids? Let's not think about that one. No, no, ignore me for a few more years. This can go on indefinitely. We'll just take it. We love it. Go ahead. It's time for Nero to share the stage with the Democrats. Go on, fiddle while Rome burns. European toys line shelves in Randy Hertzler's Lancaster, Pa., basement. The small, family-owned business has been directly affected by the crackdown on lead in toys as many of the European brands that he has sold have now left the U.S. market. When other toy retailers and manufacturers were feeling a backlash against their made-in-China products in late 2007, Randy Hertzler was riding high. 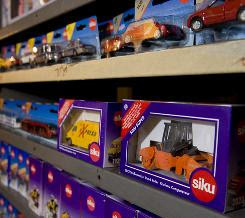 He imports and sells only European-made toys, which, like those made in the U.S., were all the rage when recalls of toys with lead paint dominated the news. The tide has turned against Hertzler, however. He can't afford to do the testing that larger chains can to meet the sweeping child-safety law enacted in response to the recalls. And the companies he buys from have stopped selling him about a quarter of the products they used to, because of costs. "Now Mattel is testing and making toys without any trouble at all, and those of us who were never the problem are in danger of losing our businesses," says Hertzler, who runs EuroSource, based in Lancaster, Pa., with his wife and two sons. Nearly two years after the safety law was enacted, Congress and the Consumer Product Safety Commission are still struggling to reduce its burden on small businesses while eliminating the risk of lead and phthalates in children's products. The law limits lead in products intended for children and requires third-party testing for certification. It also requires testing to prove products are free of phthalates, chemicals found in plastics that may harm the hormonal system. Many small manufacturers say the testing is cost-prohibitive. But its proponents say the Consumer Product Safety Improvement Act of 2008 was long overdue, as the U.S. has been far behind Europe in addressing lead and has been slow to recognize the effects even very low levels can have on children's IQs. A coalition of small businesses and manufacturers, the Alliance for Children's Product Safety, has been aggressively fighting the law, saying it is threatening the livelihoods of mom and pop shops like Hertzler's and costing larger manufacturers billions in lost sales and compliance. The efforts have had some results, but the alliance is far from satisfied. For example, CPSC delayed enforcement of stringent new testing until February 2011, but the group says most retail chains are already requiring the testing. House Energy and Commerce Committee Chairman Henry Waxman, D-Calif., has drafted legislation to exempt most children's clothing and some products sold by thrift stores and allow less costly testing methods for very small manufacturers. In a written response to questions, Waxman said the measure would "grant significant and meaningful relief to many businesses while still protecting our children from dangerous products" but "does not represent a full satisfaction of anyone's wish list." The American Academy of Pediatrics and the Center for Environmental Health say drastic changes were needed for U.S. laws to catch up with the research and to recognize the extent of the lead problem. And some advocates of the law question whether it's nearly as burdensome as suggested. Helen Binns, a pediatrician, professor and chair of the academy's environmental health committee, says it's only recently become accepted that low levels of lead exposure have a proportionally higher impact than larger amounts. "The research keeps moving ahead and pointing us to the fact that to protect children, we have to take some new stances on what's safe and what isn't." As early as 1996, the Center for Environmental Health was finding lead in everything from diaper cream to women's handbags and filing lawsuits against the companies that sold and made them. "Every time we would find lead in some new kids' products, we'd get hundreds of calls from parents asking, 'Why do I have to worry about lead in this? Isn't stuff on shelves safe?' " says Center spokesman Charles Margulis. "We were making up the standards by our lawsuits. It was a terrible way to do it." Margulis says every time the group would bring a case, businesses would say prices would go up and that they might have to close their doors. California environmental laws require hefty fines — as much as $2,500 a day per violation for each product — and Margulis says to avoid fines, "In every single case, companies changed the way they did business, and the price of the product didn't go up." The Alliance for Children's Product Safety releases what it calls a CPSIA "casualty of the week" underscoring the effect the law has had on businesses. Among the recent victims: Colorado-based American Educational Products reports it is overwhelmed by paperwork related to the law and recently had a $5,000 rock order for a geology lesson canceled because of concerns about CPSIA compliance. Minnesota toy shop The Essence of Nonsense closed its doors because suppliers were limiting what it could sell because of the law. "What the law should be about is ensuring safe products," says Edward Krenik, a spokesman for the children's product alliance. "We've crossed over into ridiculousness." CPSC spokesman Scott Wolfson says Chairwoman Inez Tenenbaum believes the "marketplace has made adjustments" and that the law is having positive effects. He notes global suppliers are choosing lead-free buttons for adult and children's clothing, which is safer for everyone and helps shift the burden from small businesses to suppliers up the line. He says Tenenbaum is trying "to find the right balance between compliance and not putting companies out of business." "You're left with two serious problems: The economy and children's health, and at some point you have to make really hard decisions," Binns says. "I'm just hopeful that some sound minds will prevail." RE: FOIA Request #10-F-00738: Request copies of all documents relating to Schylling Associates, Inc. Provisional Acceptance of a Settlement Agreement and Order. This acknowledges receipt of your Freedom of Information Act (FOIA) request seeking records from the U.S. Consumer Product Safety Commission (CPSC) and also assigns your FOIA request number. Due to certain procedural steps we are required to take under our statute, there may be delays in providing the records. Please be assured that every effort is being made to process each request as equitably as possible, and that the records or information that you have requested will be made available to you at the earliest possible date. If you have any questions concerning the status of your request, contact our office and provide your assigned FOIA request number. Scratching your head about the mounting crisis over cadmium? Let's see, the CPSC declares the Shrek glasses "not toxic" but still pushes for a recall of these safe products "in an abundance of caution". Apparently, the CPSC either believes that perfectly safe products should be recalled in an abundance of caution or that they themselves can't figure out what's "dangerous" anymore. Not a single article or a single person to my knowledge has identified a single injury caused by cadmium in a consumer product - EVER. Of course, we shouldn't ignore the fact that the people who are terrorizing America over cadmium are the very same people who are pushing for deep and invasive regulation of all chemicals throughout our society. It's the anti-chemicals crowd behind the cadmium panic. Mr. Waxman's big goal is the reform of the Toxic Substances Control Act (TSCA). Arguably, the CPSIA is the opening shot in his TSCA battle, which explains his utter intransigence in the face of well-documented catastrophes caused by the CPSIA. Cadmium is perfect for that purpose, especially since no one seems to understand the nature of the threat. Just mention cadmium and "bone softening" and the media and politicians melt. 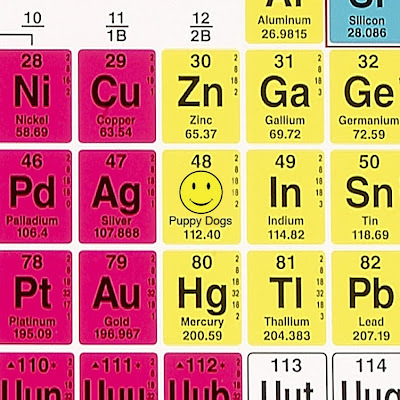 In those days, when chemistry teachers taught the periodic table, position 48 was known as Puppy Dogs. Chemistry instructors typically explained that this element was responsible for sunshine, candy, love and (of course) puppy dogs. Everything that was good and sweet in our idyllic lives were attributable to Puppy Dogs. Element 48, also known as "Smiley Face", was always the element children liked best. Most lessons were taught staring dreamily out the window at the playground, watching small children frolic and play. Puppy Dogs was good stuff. The role of Puppy Dogs in our lives and the American Way was a foundation belief in the scientific community for many years. Later, science took a dark turn. In 2007, scientists in Congress discovered to their horror that lead (Pb) was not only present on the periodic table just two squares away from Puppy Dogs but that lead was a contaminant in certain consumer products. At this time, science had not advanced far enough for Congressional scientists to know that lead has been on the Earth since creation and is found in everything including our food, water and air. Once Congressional scientists were able to detect trace levels of lead in consumer products, a specialist in the Top Secret Congressional Skunk Works connected the dots - "What about kids? If they play with Puppy Dogs, it's just two squares away from LEAD!" This is what prompted passage of the CPSIA. Am I being too science-y? Sorry. As you know, science marches on and in a very recent 2010 development, scientists at the Consumer Federation of America, led by Rachel Weintraub, and at the CPSC discovered that Puppy Dogs was actually NOT the 48th element. After urgent research into how sunlight was created if not by Puppy Dogs, cadmium was discovered accidentally when someone pulled on their earlobe while deep in thought. "Cadmium is a chemical element with the symbol Cd and atomic number 48. Cadmium represents a low point in American science education. 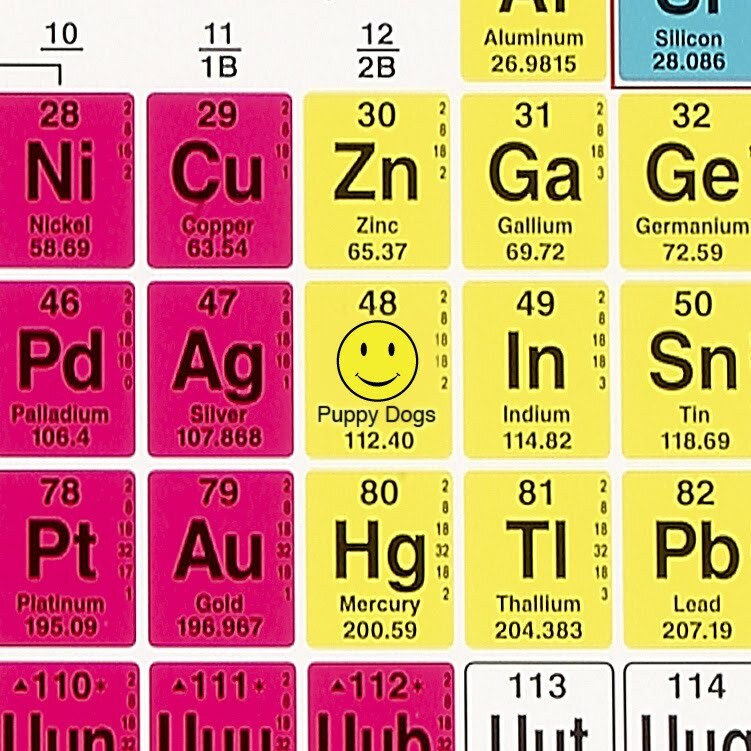 In a little known provision of the "Treaty of the Meter" signed by the United States in 1878 signalling the promising beginning of the metric movement in our country, the 48th position of the periodic table was deemed to be a Smiley Face and called "Puppy Dogs". American science, never questioning this regulation, eventually traced the origins of sunshine and love back to this phantom element. In early 2010, scientists at the U.S. House of Representatives noticed that lead (Pb) was located near Puppy Dogs on the periodic table, and in a rapid series of science-y experiments, determined that Puppy Dogs was actually a soft, bluish-white metal chemically similar to the two other metals in group 12, zinc and mercury. Frighteningly, experiments have determined that cadmium, if dumped into a river in massive quantities as mining run-off over a period of decades, will cause bone softening in nearby populations ("Ouch-Ouch Sickness" is also known as one of the Four Big Pollution Diseases of Japan)." So that brings you up-to-date on cadmium, bone softening and toxicity. I hope this helps you understand why your Congress and the CPSC are trying to save you from dangerous cadmium. Apparently, you need a lot of "saving". In my case, I am just going to stop drinking from rivers downstream from WWII mining operations in Japan. That should probably be enough protection for me. To close the loop on the Schylling fine fiasco, I wanted to provide you with the language governing the statute of limitations applicable to this matter (and all other CPSC matters unless specifically overridden by statute). For those of you who don't know, a "Statute of Limitations" is a provision in the law which states a maximum time after the occurrence of an event in which legal proceedings can be initiated. In the case of CPSC penalties, in the absence of a "tolling" agreement in which the warring parties agree to extend the time limit, these provisions are intentional limitations on the CPSC's power. There is longstanding public policy that underlies the concept of a statute of limitations going back to ancient English common law. The Schylling lead-in-paint violations were clearly beyond the statute of limitations. By the way, there is no exception to the provisions of a statute of limitations if the regulator is "really mad" or if the violator is a "bad guy". It's an ABSOLUTE rule and works effectively even against serious violations; for instance, prosecution of felonies can be closed off by statutes of limitations. The issue with respect to Schylling's separate (but related) violation of "failure to report" is somewhat more controversial. When did the failure to report "occur"? The CPSC may be taking the position that the period relating to the failure to report begins when a report is finally made. In effect, then, the CPSC has interpreted the statute of limitations away for failures to report. Arguably, this means that the CPSC reserves the right to penalize people for a failure to report going back to 1972, the year in which the agency was formed. Why not, they have the power . . . . . Everybody, keep an eye on your mailbox! Don't tell me that this surprises you nowadays. The national convulsions (call it "brain softening") induced by the CPSC's action in forcing McDonald's to recall admittedly SAFE Shrek drinking glasses continued to spin out of control today. Following their usual election year script of harshly dealing with invented crises to impress the easily-duped public, Henry Waxman and Bart Stupak, two Democratic leaders on the House Energy and Commerce Committee, sent letters today to McDonald's and the manufacturer of the glasses, ARC International, demanding information to blow this non-issue up into a mega-crisis. Before I summarize how Waxman and Stupak worked to spread regulatory disease far and wide, I think we all owe a big THANK YOU to the CPSC for so vigilantly protecting us from these safe products. There is no doubt that we were all victims of a false sense of security, not knowing that atoms of cadmium might be lurking on the outside of drinking glasses. Of course, cadmium atoms also lurk in our food, in our water, in our air, in our dirt AND on countless glasses in our homes sold over preceding decades without incident - but, heck, that's a little too science-y, don't you think? Only by exposing that these glasses are SAFE while at the VERY SAME TIME pushing for a highly-publicized recall and resulting media panic, did the CPSC reveal that we were actually safe without even knowing it - and yet they STILL acted to protect us! What a great bunch of guys and gals we have at the CPSC, we are so lucky. No really, thank YOU Consumer Product Safety Commission! A list of all manufacturers and distributors that supply McDonald's with children's products. McDonald's interest in keeping its suppliers' identities confidential as a trade secret is no never mind. After all, the glasses they recalled are SAFE, so you can't take ANY chances. And let's not forget the FACT that the other McDonald's items are NOT suspected of ANY violation of ANY law. This is Mr. Waxman's wizardry to keep us all so safe. . . .
A list of all the "steps" McDonald's takes to ensure that children's products do not contain hazardous materials. The FACT that the CPSC has declared these glasses SAFE does not apparently matter in this inquiry, raising the question of what Waxman and Stupak mean by "hazardous materials". Presumably then, the presence of an atom of cadmium might meet their "standard" for hazardous materials. In utopia, there is no cadmium. Waxman and Stupak represent the 1st and 8th Congressional Districts of Utopia, respectively. The identity of the supplier of the enamel on the SAFE glasses. This identity had previously been withheld by ARC, showing character by attempting to keep the crisis away from an innocent supplier. As ARC said in a recent newspaper report, "[it] could have been any glass company. . . . We all do the same thing using materials from the same suppliers." I find it ironic that the Ranking Member of the Subcommittee on Oversight and Investigations is none other than Michael Burgess. Burgess is a doctor (M.D.). Maybe he has a sense of what constitutes an actual hazard to human health. If he does, I hope he shares it with his colleagues on the other side of the aisle. . . .
Hey, let's not get too paranoid here. No one is going to pay attention to this mass hysteria or change how they regard the federal safety laws. This mega-screwing of two reputable companies over admittedly SAFE products is not relevant to the rest of us. Why? They'll never be interested in us because we all make . . . SAFE PRODUCTS. CPSIA - McDonald's Shrek Glasses Weren't an "Imminent Hazard"
Some people apparently think I contend that product recalls can only take place if the CSPC insists. I have certainly argued that the CPSC has no authority to demand or even ask for a recall unless certain specific conditions are met. Hate to be the bearer of bad news, guys, but there are limits to the agency's legal authority. Companies themselves can recall products for any reason. There need not be a safety reason - you can recall something from the market because the color's wrong, the material is somehow less than expected, wrong size, wrong instructions, wrong packaging, whatever. A company's ability to recall its own products is not limited by law. In the case of the McDonald's Shrek glasses, yes, McDonald's declared a voluntary recall. That's not unusual - the vast majority of recalls are voluntary. Only a tiny handful of recalls every year are "mandatory". In any event, the critical issue here is NOT that McDonald's made this choice. As we have discussed, the publicity from this event forced McDonald's hand - they had to protect their brand at all costs. The issue here is that the CPSC apparently "urged" the company to "do the right thing". [These words come from the OnSafety blog, the official blog of the CPSC, believed to be written by Scott Wolfson, Director of Public Affairs.] It was apparently the "right thing" to do although the agency conceded that the glasses were "not toxic", in other words SAFE. While companies are allowed to choose to recall safe products at their pleasure, the CPSC does not have the unlimited legal authority to reach out to American companies and tell them to take this kind of voluntary action. The power to recall emanates from certain provisions of the CPSA and FHSA. Notably, Section 12(a) of the CPSA, the agency can't go to court unless there is an "imminent hazard". What might that be? "As used in this section, and hereinafter in this Act, the term 'imminently hazardous consumer product' means a consumer product which presents imminent and unreasonable risk of death, serious illness, or severe personal injury." Given that the glasses have been acknowledged to be "non-toxic", this standard is impossible to meet. "Hazardous material" is defined in Section 2(f)(1)(D) in relevant part as "Any toy or other article intended for use by children which the Commission by regulation determines, in accordance with section 3(e) of this Act, presents an electrical, mechanical, or thermal hazard." And Section 3(e) refers only to electrical, mechanical or thermal hazards, clearly inapplicable here. Bottom line, the McDonald's glasses are outside the reach of the CPSC . . . if the wording of its principal empowering laws matter anymore. CPSIA - What Does "Not Toxic" Mean? Apparently, certain people who should know better have asserted that "not toxic" does NOT connote safety. They implausibly argue that it's "not the same thing". In other words, the argument goes that if you were to contend that something is "not toxic", it is somehow different than saying that it's "safe". I beg to differ. Certain people apparently think I don't "get it". We should check that out, don't you think? I am pretty sure these certain people are native speakers of English, so we can't go there. Mr. Dictionary stepped up to resolve this difficulty. Here are some definitions that may help sort this out. Some dictionaries do not define "non-toxic", relying instead on the definition of the root word "toxic". I hope you, too, can make this leap. a. American Heritage Dictionary (Official Edition): This is on my desk for just such an occasion. "Toxic" is defined as "Of or caused by a toxin or poison". The definition of a "toxin" is (in relevant part) "a substance, produced by a plant, animal or microorganism that . . . is capable of producing poisoning when introduced into the body . . . ." A "poison" is "a substance that causes injury, illness or death, esp. by chemical means". So I derive that "not toxic" means that the substance in question will NOT cause "injury, illness or death". I think you might call such a thing "safe". b. The Free Dictionary: Two definitions of "nontoxic": (i) not producing or resulting from poison, and (ii) safe to eat. So according to this dictionary, "not toxic" means you can eat it safely. Not sure I'd recommend that for, say, a painted glass, but perhaps other people would. c. Wikipedia: "Toxicity" is defined as "the degree to which a substance is able to damage an exposed organism." So something that is "not toxic" is something that has NO ability to damage an exposed organism. Another word for such a thing is "safe". d. Thesaurus.com: Perhaps most pertinently, the primary synonym for "non-toxic" is "harmless" and the short definition is "not injurious or dangerous". The full list of synonyms is "controllable, disarmed, gentle, guiltless, hurtless, innocent, innocuous, innoxious, inoffensive, inoperative, kind, manageable, naive, nonirritating, nontoxic, painless, paper-tiger, powerless, pussycat, reliable, safe, sanitary, simple, soft, softie, sound, sure, trustworthy, unobjectionable, unoffensive". [Emphasis added] The antonyms are "bad, destructive, evil, harmful, hurtful, injurious, sinful, wicked". So, just to be clear, when someone, anyone says something is "not toxic", what they mean is that it is SAFE. This is always the case, even if they flap their arms wildly about . . . for reasons that only they can provide. The spectacle of the McDonald's cadmium "scare" continued to unfold today. Let's not forget that this recall was "urged" by the CPSC although the CPSC admits in writing that the glasses are "non-toxic". In other words, the glasses are safe. As the manufacturer notes: "'It could have been any glass company,' said Ron Biagi, an executive with Arc International, which made the glasses. 'We all do the same thing using materials from the same suppliers.'" McDonald's clearly had no choice in the matter, suffering a terrible loss of prestige no matter what the outcome. So the CPSC, Rep. Jackie Speier, one anonymous tipster and a hyperbolic press forced a highly wasteful and destructive recall. The tumult, chaos and confusion thoughtlessly spawned by the CPSC continues to unfurl in almost predictable fashion: "But the returns [to McDonald's] are just the beginning of the next chapter in the cadmium debate, with the CPSC poised to set new limits on the metal even as it downplays the McDonald's recall and environmental advocates aim to use the episode to build momentum for reform of federal toxics law." A terrible move deserves an even worse follow-up. What's the cause for alarm here? The glasses are safe, so says the CPSC . . . as it dramatically lowers the standard for cadmium. Yeah, nobody's worried. Some in the press aren't persuaded. After all, urban myths are true . . . aren't they? "[David Lazarus of the LA Times] notes that Cadmium has probably stayed off the radar for so long because people weren't widely aware of its use. The focus has primarily been on the danger of lead products, and lead product replacements weren't a primary concern. Chinese manufacturers began using Cadmium insted [sic] of lead to get the same vivid pigments in product colors." Right. David Lazarus knows all about this. And then there are our Democratic leaders in Congress. It's election season so there's little incentive to be a calming influence. "Congresswoman Jackie Spear [sic], who first received the anonymous tip about the Shrek cups, doubts Europe is the Cadmium culprit due to its strict manufacturing rules. Spear [sic] suspects either a subcontractor or ingredient provider in China; China is one of the leading Cadmium producers in the world. . . . Spear [sic] says she has legislation in the works that would expand the Cadmium ban in U.S., specifying removing its use in any product for children." And the basis for Rep. Speier's hunch is . . . what, exactly? The glasses were made in a U.S. factory: "In contrast to the Chinese-made children's jewelry recalled earlier in the year, the drinking glasses were manufactured in the United States, by the Millville, N.J.-based company ARC International. Ron Biagi, vice president for North American sales at ARC, said he was surprised by the recall and vouched for the safety of the glasses. While environmental and consumer groups pointed to the importance of identifying the producer of the cadmium-tainted enamel used on the McDonald's glasses, Biagi declined to name ARC's supplier. 'It's not fair for me to pull them in,' he said." OMG, somebody decent is left in the world! I had about given up hope. Having set off the blaze, CPSC Director of Public Affairs Scott Wolfson again spewed more of his patented mixed signals sure to sow seeds of doubt: "'What's so important is for parents to understand the difference. ... Children are not at an acute risk; the glasses are not toxic,' Wolfson said, adding that 'there are no signs we're looking at a wave here of cadmium becoming the next lead.'" Which is why, Scott, you and your agency acted so promptly to push for a recall of this non-toxic product made of common materials in wide distribution in this country for years without any detectable adverse health effect? Which is why you told America to stop using the oh-so-safe glasses "immediately" in your OnSafety blog? Do I have this wrong? Clear as mud. Very believable, too. There are terms for this that are too crass for a family publication like my blog. Let your imagination run. How will all this resolve itself? Of course, not very well. Justified by fear of "bone softening" (that sounds HORRIBLE, doesn't it?) and other bizarre maladies that supposedly COULD befall us from unspecified exposure to cadmium, we will get many new and ineffective regulations imposing yet more devastating costs and devastating risk on the children's product industry. While hatred of government is a necessary by-product of the massive self-inflicted injury of the CPSIA, we will more pertinently be faced with the difficult challenge of protecting our life's work - our businesses. The livelihoods of our friends and associates at our company, the economic well-being of our customers and suppliers (often our close friends, too) and in our case, the economic future prospects of the kids who are being educated with our products, all hang in the balance. I don't know what stops this freight train before it tragically collides with reality. Certainly not leadership or a show of character from our government. I hate to close these essays sounding like a Tea Partier (not that I resent the label). I don't wish to be marginalized for having strong views about an abdication of leadership and judgment by our government leaders. Say what you will, the McDonald's fiasco was fomented by politicians with agendas. Many companies and people - and our economy - will be severely damaged as a result. There's nothing to be proud of here. Labels: Cadmium, Compliance, CPSC Leadership, House Leaders, Recalls, Who Can You Trust? CPSIA - McDonalds Recall Urged by CPSC - WHY? CPSIA - Schakowsky's Opponent Has the Horses! CPSIA - The Madness Continues . . . .